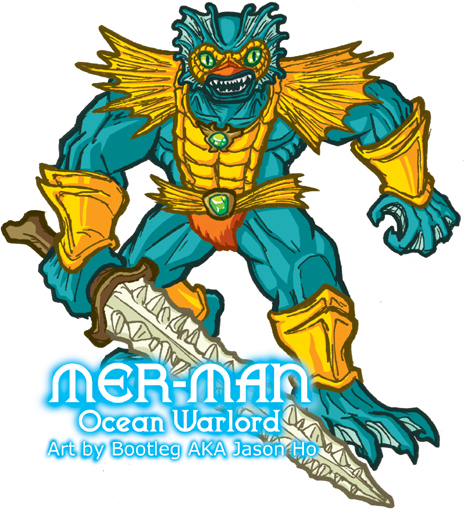 ... it's a sketch of Mer-Man--Ocean Warlord, and minion of Skeletor! As usual, this was posted on the He-Man.org fan-art forums. My post is here, the entire thread (including my Skeletor sketch) is here. Of my posts so far, this sketch is probably the... sketchiest. The pose is ten kinds of awkward, and the body is just a shade too squat, even by the uber-buffed standards of He-Man action figures. On the other hand, the face turned out the way I wanted it too, and I'm pretty satisfied with the colors... Well, they can't all be winners. you ate a premature baby! ren: it was chewy on the outside and crunchy on the inside. annonymous: i ate the rest of the curly fries for breakfast the next morning. those pancakes, however, will forever be a badge of shame. i wear them like medals on formal occasions. aside from the delish curly fries...for even more on Ethel merman...I just did a post on my favorite female vocalists (Ethel made it). Last Saturday I did a post on the top male crooners too. Interested in your opinions. stop by and say hi sometime.